At Glitzy Secrets, we have always been huge fans of the exquisite vintage inspired wedding dress collections by Eliza Jane Howell. In fact, you will spot their signature creations featuring in many of our photo shoot campaigns. Expertly designed by Gill Harvey, the gowns are made for the romantic bride who wants to add a dash of bygone glamour to her aisle style. Does this sound like you? Well, you’ll want to stick around as we’re discussing this award-winning label and their latest collection to hit the wedding scene – we think you’re going to love it just as much as we do. Eliza Jane Howell was named after Gill’s grandmother who was also a Fashion Designer. Following in her footsteps, Gill graduated at the Royal College of Art in London and went to achieve international success with her Medici collection of knitwear. After introducing collections of occasion and red carpet wear, 2012 saw the launch of Eliza Jane Howell. Hand beaded, embellished and embroidered, each bridal gown is lovingly made using a blend of traditional and modern techniques. Now a multi award-winning label, the brand has become the choice of thousands of brides and celebrities. The Grand Voyage by Eliza Jane Howell is the epitome of royal elegance, a collection that is guaranteed to turn heads and make a statement at any wedding celebration. Inspired by the traditions of the 17th and 18th centuries, the paintings, designs and fabrics from the era heavily influenced the new collection of wedding gowns. The renowned designer describes them as, “a masterful fusion of contemporary style with a classic sensibility.” You’ll find gowns adorned with exquisite detailing, fabulous fringing and an abundance of delicate beading. Smitten yet? Us too! While pink isn’t for every bride, we absolutely adore the muted rose hue of these dresses. Perfect to complement blush colour schemes, the tone is subtle and full of antique vibes. For brides who want something truly unique for their wedding day, the Uffizi Rose D’or will satisfy your fashion-loving heart! From the exquisite embellishment to the romantic rose hue, this iconic masterpiece is nothing short of breath-taking! The essence of pure sophistication, it’s plain to see why Kate, Megan and Eugenie shunned bare arms in favour of timeless longer sleeves. 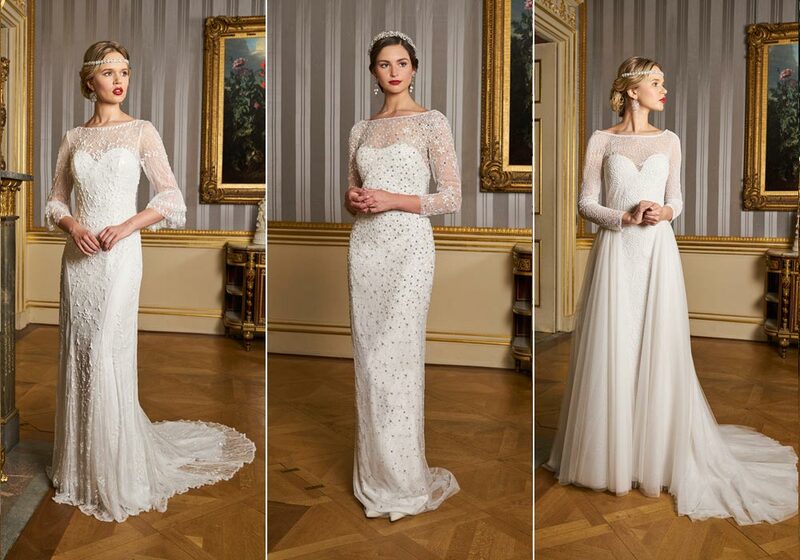 If you adore an elegant and classic look, opting for 3/4 or full length sleeve will instantly create a classy look and we just love the slightly sheer embroidered fabric that brings a modern touch to a traditional style. If long sleeves aren’t for you, capes are one of the hottest bridal trends out there at the moment and it looks like they are set to stay in the spotlight. The Corinth Cape is a firm favourite of ours from The Grand Voyage collection, encapsulating the sheer glamour of the era. A cape is a divine addition to any bridal look and it can easily transform the simplest of gowns into something rather spectacular. 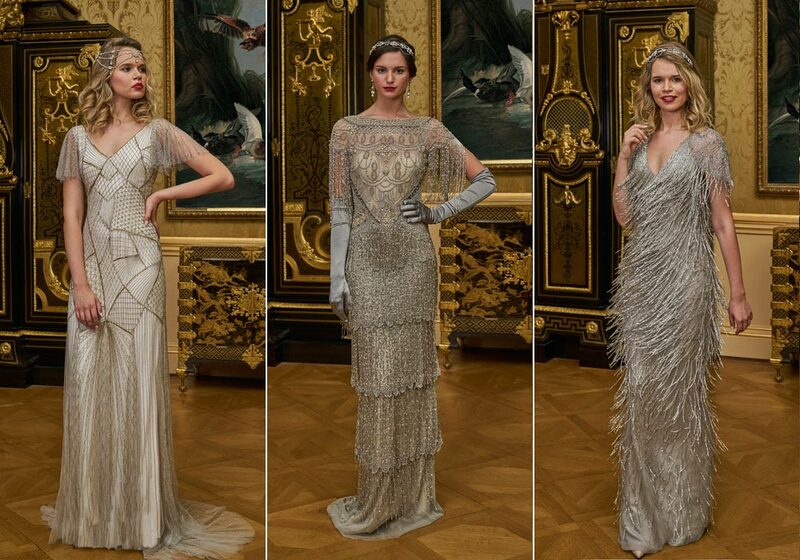 If you are opting for a Roaring Twenties theme, these gorgeous metallic dresses are the epitome of Gatsby Glamour. The Tivoli gown is the perfect fit for the bride who wants to dazzle her way down the aisle in glamorous platinum! 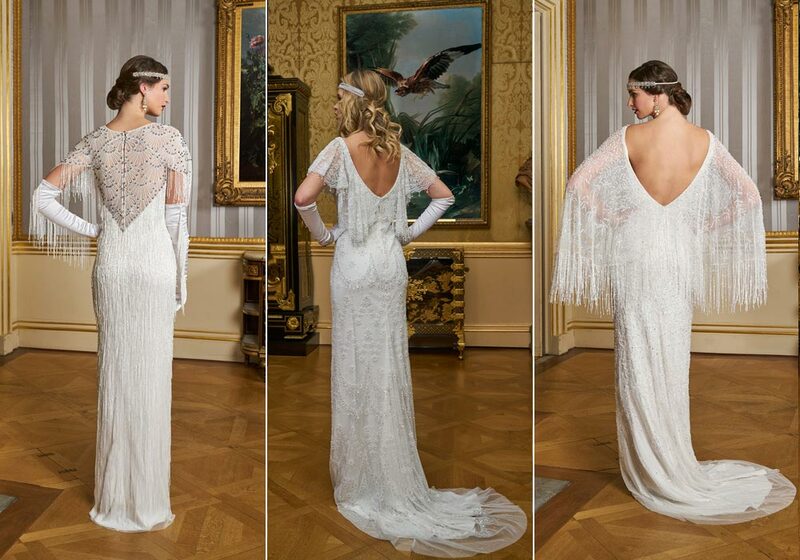 The epitome of regal romance, you really will feel like a Hollywood Starlet wearing this on your wedding day. 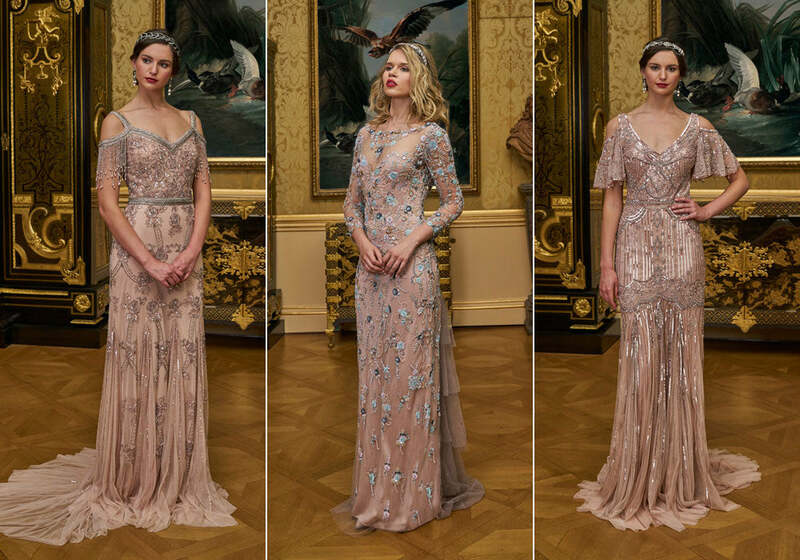 The detailing is nothing short of exquisite and we think the divine metallic tones make these gowns utterly fabulous to wear to a ball or ultra glam event beyond the big day too. 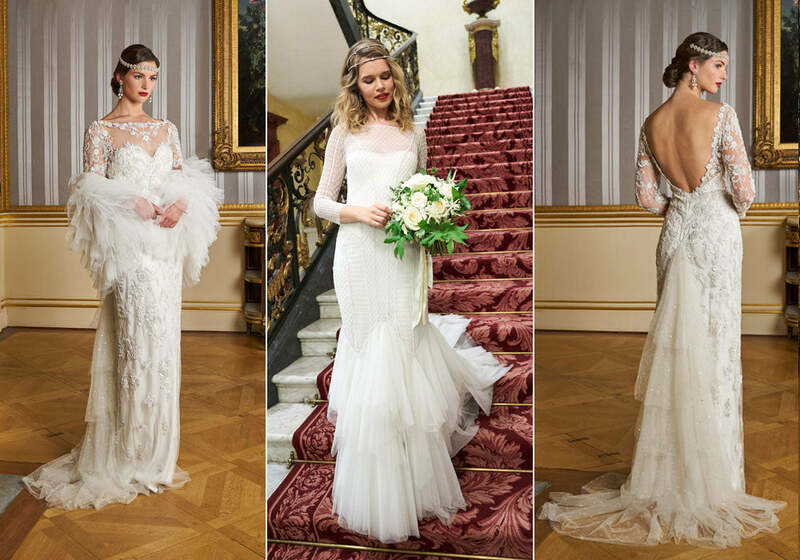 Whether your bridal style is vintage or modern, Eliza Jane Howell’s latest collection will have you swooning. Photographed at Hertford House, the collection looks incredible against the backdrop of this 18th century building, with the treasure trove of art and architecture acting as the perfect partner for the elegance of The Grand Voyage collection.